4 years Baccalaureate Degree programme in Nursing is a broad based education programme within an academic framework specifically directed to prepare graduates who can assume responsibilities in Clinical and educational sector as professional and competent nurses and midwives in providing promotive, preventive, curative, and rehabilitative services. 2 years Post Basic B.Sc. 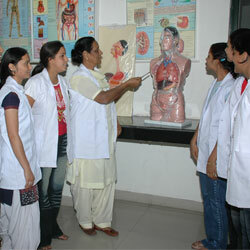 Nursing Degree programme builds upon the skills and competencies acquired at diploma level. It is specifically directed to the upgrading of critical thinking skills, competencies and standards required for practice to work in the clinical, teaching and administrative areas. Basic Three year Diploma programme offered to senior secondary pass-outs to train them as nurses who will be able to work as First level care-givers in Hospitals, Clinics and Communities. 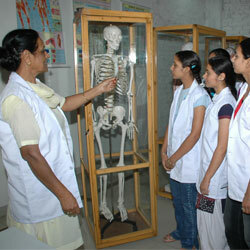 SION has been approved by The Indian Nursing Council PNRC (Punjab Nurses Registration Council). Though the nursing institutes in India produce a large pool of nurses every year, there is no denying that they lack the much needed practical knowledge and hands on experience. Considering the medical boom that India is likely to experience the next 20 years, there is a need for quality education in nursing. At SION, we try to bring innovations in teaching methods so that the students have a clear understanding of the subject.